Corner hutches are a wonderful way to make efficient use of space while bringing life and charm to just about any dining room. With a solid wood corner hutch built by the Amish, you can also show off your family's best silver or other heirloom treasures in a case that is itself a beautiful masterpiece. The Queen Anne style dates back to the early 1700’s during the rule of Queen Anne of Great Britain. 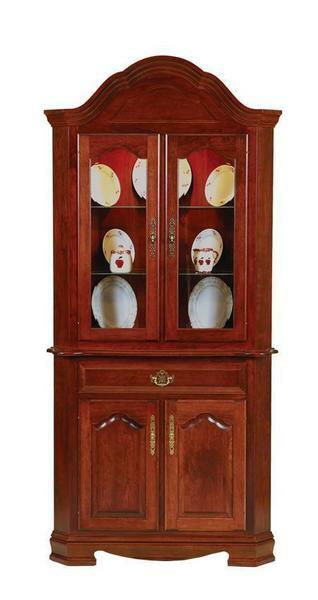 The Queen Anne style is highly decorated and elegant, and is perfect for formal dining rooms. Our Amish craftsmen have been building Queen Anne dining room furniture for generations, bringing this touch of class to uniquely American made furniture and the dining rooms of American households. This beautiful Queen Anne Corner Hutch comes fully loaded with many impressive standard features. It is made of our choice in solid hardwoods and beautifully finished in a wide range of finishes (we'll send you some stain samples upon your order). The drawer is dovetailed for a lifetime of strength and added beauty. Beveled glass shelves and touch lighting are also standard. At DutchCrafters, the excellence found in our Amish furniture is matched by the level of service we give to our customers. That has earned us an A+ Rating from the Better Business Bureau, which we have maintained through the thousands of happy customers we have served across the United States and Canada. Give us a call to speak with one of our Amish furniture specialists, who can answer your questions, accommodate special requests and help you to place your order!